To market your art, you need two things: art and people who might be interested in it. It’s helpful to think of people grouped in concentric circles that surround a core of you and your art. Closest to the core are people in your inner circle – family and friends who are open to hearing about your art activities. They are often willing to share about your art with people they know, but you don't know – those in the middle ring. The hardest people to reach are those neither you nor they know – in the outer ring. Marketing is an exchange relationship. As artists who want to sell our work, we must create relationships with the people in each group – they are all potential collectors. With our inner circle, the initial exchange in a relationship is conversation and sharing about our art. At the next level, it may be a gift, or a trade. Eventually, the exchange is a financial transaction. Family and friends do buy our work. But key to continually selling our work and having an art career is our ability to extend relationships to an outer ring of people. (B) “I’ll be posting the finished painting on my website. Would you like a business card? If you choose (A) you ended the conversation. You have been friendly, but you have not made a connection. If you start at (B), you have widened the opportunity to create a relationship. You have shared information, and you are requesting the other person take action. If they say no, you say (A) and get back to painting. By choosing (C) you are in the broadest and best position to create a relationship. You are offering something, and in exchange, you may get something – the email address of someone open to knowing more about you and your art. If they decline, you can retreat to (B) and offer a business card. If they decline, you can say (A) and get back to painting. 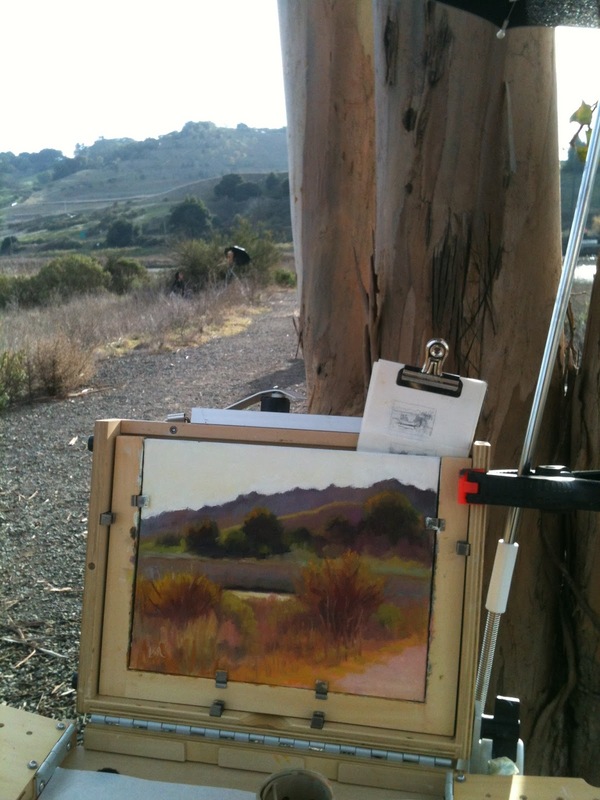 Think of possibilities you create when you take the small risk of engaging in a conversation with a passerby the next time you are out in the field – before long, you may be selling wet canvasses to strangers right off your easel. Have a marketing question you want answered in a future blog post? Leave it in the comments. Thanks for these posts, Linda. I was thinking about reviewing my own market today, so am happy to read what you have to say. Also, congrats on your new blog! BTW, I like you signature block so much I am going to Photoshop right now to add one to my blogs! It is a good move - thanks! I will let others know about your blog and marketing website. I'm glad we met - now I see you live in Mill Valley. I am writing a blog post on making banners with Photoshop and I will put a link to you because I liked your footer/signature block so much. I may get it posted today, and if not I will post asap. Thanks for the introduction to Linda, Casey. Good advice in this post - looking forward to reading more. Start small. Start with your group of friends, or people who are in the same wavelength as you, but I like your approach too. It’s more personal rather than in-your-face, which helps your customer to feel that you’re not using them as some marketing outlet. At the very least, if they don’t like your painting, at least you can make a friend. Thanks for the conversation pointers. I need those suggestions for open ended responses to continue the conversation. I enjoy reading your blog. Thanks, Masako and Yvonne. My grandmother had a saying "You catch more flies with honey than you do with vinegar" which I think applies here. Be friendly and people are attracted to be around you.